In this presentation, Gini focused on how to use media relations to build awareness and drive SEO results by encouraging valuable links back to your website or blog and, as a result, increasing your site's domain authority. Her reasoning: most approaches to measuring media relations focus on fuzzy parameters (e.g., impressions, ad equivalencies). The web, however, gives a better way to measure awareness by focusing on domain authority, obtaining links back to your site and monitoring whether search traffic is growing. "... a score (on a 100-point scale) developed by Moz that predicts how well a website will rank on search engines. Use Domain Authority when comparing one site to another or tracking the “strength” of your website over time. We calculate this metric by combining all of our other link metrics—linking root domains, number of total links, MozRank, MozTrust, etc.—into a single score." Why Does Domain Authority Matter for Link Building? The goal is to improve your own domain authority and the best way to do that is by focusing on those with similar domain authority and obtaining links from them (see the visual below showing link popularity/domain authority) which include as the anchor text keywords you consider important for your site. Links represent credibility. The more links you have from credible sites, the more credible you are. As you get more credible, your domain authority improves and you become more visible. What Are the Steps for Using Media Relations to Drive SEO for Business? Using the example 'brain games" vs. 'brain games for adult', Gini demonstrated the steps she uses for using media relations for SEO. Enter both terms in Google Adwords to get a sense of monthly search traffic. 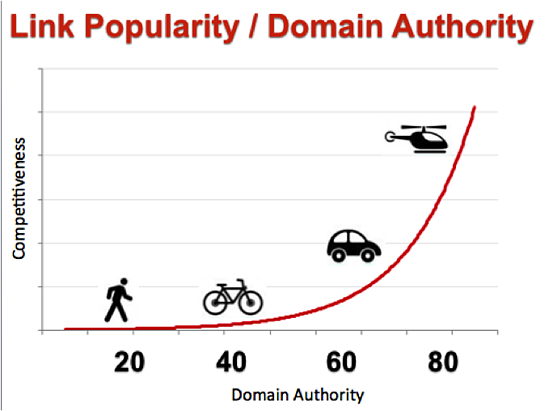 To determine which of the two terms is the better one to focus on for a site with a domain authority of 47 (i.e., a bicycle in the chart above), Google both terms and observing the domain authority of the results. 'Brain games for adults' is by far the better term, with competing sites which fall within a reasonable range. Next, create a chart where you list the URLs of the search results and the domain authority so you can determine which sources are ones that you can compete with (i.e., within your range and slightly above your domain authority). Then, brainstorm content ideas that might appeal to these sources (e.g., gift lists for Mother's Day about brain games for adults) when you approach them. Be sure to research those sources so you have an idea what content gaps they have that you might fill. Write your content then pitch it to them with a link to your site ideally to a page where you have built out content about brain games relevant to the audience in question. Consider adding a lead generation piece on that page. Don't forget to use your keyword in the anchor text of the link. Media relations can be particularly effective around publications that already talk about what you want to talk about. You can do the same kind of thing with blogger relations, approaching bloggers who address similar topics. Gini recommended waiting 30 days after publishing a blog article on your site to publish a second one on a related topic. Add it to Facebook Notes, then wait 30 days before pitching it to another site. 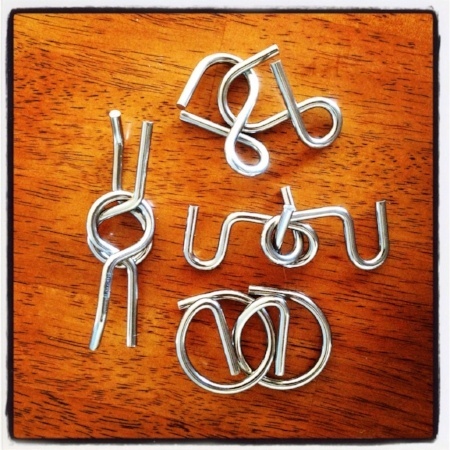 Repurpose your content on other sites, with relevant anchor text and link back to your site. Don't Forget to Track Awareness and SEO Results! Track results in Google Analytics so you understand which are the better sources based on traffic, pageviews and time on site. Monitor in case your links aren't included. Spend time building relationships with the sites/publications which drive high quality traffic to your site. Also track your domain authority and search rankings so you can determine whether your media relations strategy is working to drive SEO. Domain authority is updated every few weeks, so check on a monthly basis. Here is Gini Dietrich's presentation from INBOUND15 (see How to Use Media Relations to Drive SEO: GINI DIETRICH [Ideas & Experiences] for the video). Do you use media relations? Have you taken a similar approach to building your domain authority? How do you build awareness for your business online? I'd love to hear.